Individuals who are thinking of using valerian to treat a sleep or anxiety disorder should first familiarize themselves with the possible side effects related to the use of the supplement. Valerian may cause mild side effects in select patients, including headache, excitability and insomnia. Although rare, severe allergic reactions and serious side effects may occur in a small number of users. Valerian induces drowsiness that may still be felt the day after use. It is important to evaluate valerian’s effect on your body before driving or operating heavy machinery. If the feelings of residual drowsiness are consistently severe with regular use, talk to your doctor about an alternative form of treatment. These side effects are considered more of a nuisance than a serious health concern. They very rarely require medical attention and usually go away within a few hours of taking the valerian supplement. If these common side effects become persistent or bothersome, it may be necessary to adjust your dosage or discontinue valerian treatment. Consult your doctor or pharmacist for other ways to minimize common side effects of valerian. Although these side effects may be moderate in intensity, they usually pass on their own and rarely require medical attention. Valerian users can minimize the occurrence of these types of side effects by following the dosing instructions on the supplement label, or by taking valerian exactly as directed by their doctor or pharmacist. Anesthesia and other drugs used during surgery work by slowing down the body’s central nervous system. Because valerian supplements also have a slowing effect on the central nervous system, users are cautioned against using valerian products in the weeks leading up to a scheduled surgery. It is recommended that patients discontinue the use of all valerian supplements at least two weeks before going into surgery to avoid potentially harmful side effects. After your surgery, consult your doctor to determine how long you should wait before resuming valerian treatments. Unlike medications approved by the Food and Drug Administration, the treatment claims of valerian supplements cannot be backed by hard data from clinical trials in most cases. However, satisfied users often swear by valerian for the treatment of mild sleep and anxiety disorders. Because valerian has such a low occurrence of reported side effects, patients who are considering valerian for the treatment of a wide range of disorders may be able to do so without substantial risk to their health. 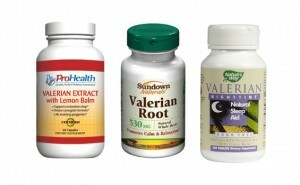 Consult your doctor if you have concerns about whether using valerian supplements is right for you. Make sure to fully disclose your medical history, as well as any prescription or OTC drugs that you are taking, so that your doctor is able to make an informed decision regarding your treatment. Most importantly, be mindful of how you feel while taking valerian supplements and contact your doctor at once if you feel that you are experience a side effect as a result of those supplements.